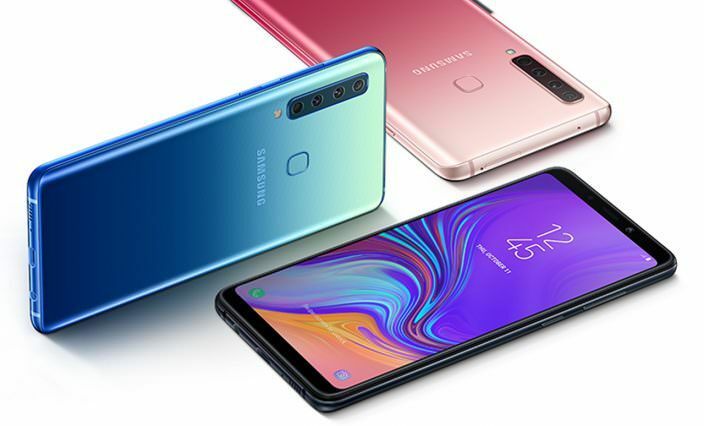 Samsung has expanded the A-series with a smartphone that features a 'quad camera'. The 'number of lenses you can pack into a smartphone' race continues with Samsung added a 'quad camera' to the Samsung Galaxy A9. The 'quad camera' is built into the rear of the new A-series smartphone and it's made up of the main camera featuring 24MP, AF and an f/1.7 aperture; Telephoto lens with 2x optical zoom, 10MP, AF and an f/2.4 aperture; Ultra-Wide lens with a 120-degree field of view, 8MP and an f/2.4 aperture and finally, the Depth lens with 5MP and an f/2.2 aperture. 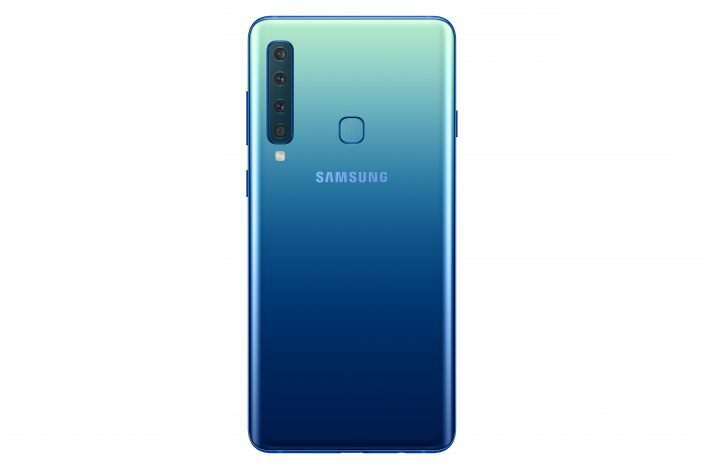 On the front, you'll find a 24MP, f/2.0 selfie camera. 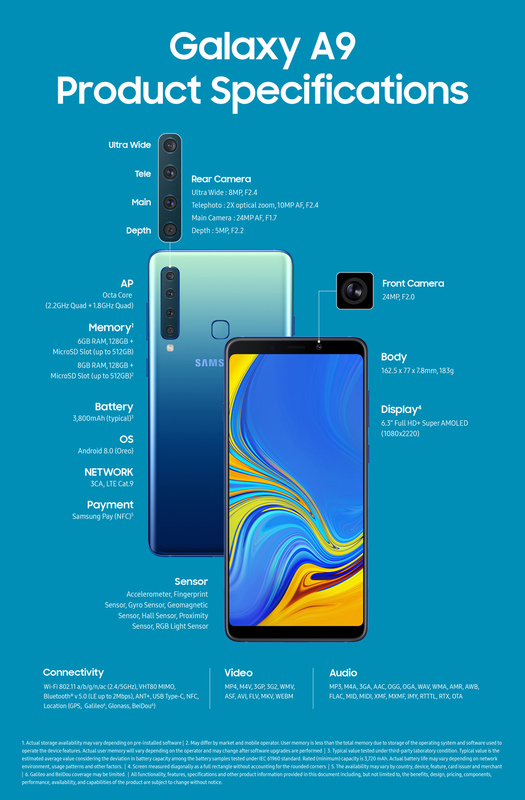 Screen-size, it's pretty big at 6.3" but the Full HD+ Super AMOLED, 1080×2220 screen isn't anything oversized when you compare it with some of the smartphone releases we've seen of late. The Galaxy A9's body measures 162.5mmx77mmx7.8mm which with the size of the screen, is to be expected, but it's bigger than the recently announced Google Pixel 3 XL which has the same size screen in a body that measures 158mmx76.7mm. A 3,800mAh battery is built in and the glass back will, of course, allow for wireless charging. Some of the standout AI features for photographers include the Scene Optimiser which is able to identify the subject and adjust settings accordingly for the best photo while Depth Lens allows you to change the depth of field and focus. 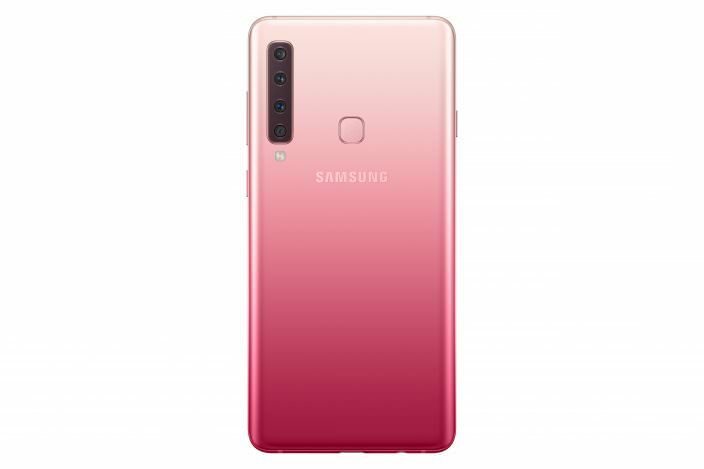 The Galaxy A9 will be available in the UK from November for £549 in three colours: Caviar Black, Lemonade Blue and Bubblegum Pink (the blue and pink actually have a gradient to them and they look pretty cool) with 128GB storage and up to 512GB of expandable memory. 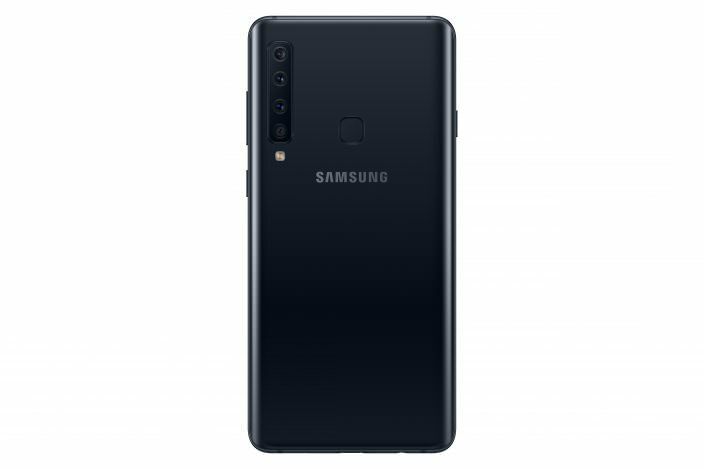 The Galaxy A9 joins the Samsung Galaxy A7 announced in September which has a triple camera.